I am no longer at UIC. Ph.D. / Research Assistant Computer Science Dept, University of Illinois at Chicago. Master of Science (2000-2002), School of Computing, National University of Singapore. Bachelor of Science (1995-1999), Computer Science Dept, Peking University. 8+ years research experience in Data Mining (including visual data mining, web, text, etc.). 2 years Oracle experience in Oracle China H.Q., Technical Support Analyst. Profound skills in Java, VC++, Oracle DB/WebServer, UNIX, MS Windows/Office, etc. Data Mining: Visual data mining, Industrial data data mining, Web mining, Text mining, etc. 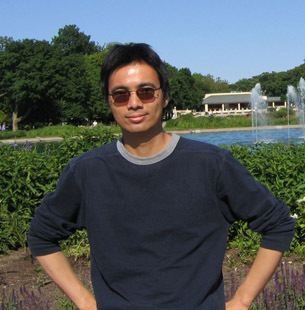 Ph.D. supervisor: Prof. Bing Liu. Currently in research cooperation with MATC, Motorola Advanced Technology Center, IL. USA. Knowledge synthesizing project with Motorola. Automatic topics/opinions extraction project with Motorola. Kaidi Zhao, etc. Data mining with Motorola PCS, on certain system log data. 2004, 2005. Kaidi Zhao, etc. "Knowledge Synthesis System". Release 2004 and 2005. Project release with Motorola Labs. 2004, 2005. Kaidi Zhao, etc. "V-Miner, Using Enhanced Parallel Coordinates to Mine Product Design and Test Data". Research project deliverables document for Motorola. Feb. 2004. Kaidi Zhao, etc. "Visualization Powered by Approximate Data Mining". Project for Motorola Advanced Technology Center. 2003. Research Assistant: University of Illinois at Chicago, with Motorola Advanced Technology Center. Research Assistant and Scholarship: National University of Singapore. 1998 - 2000: Technical Analyst in Support Service Department of Oracle China, Beijing Head Quarter (1998-1999 act as trainee).